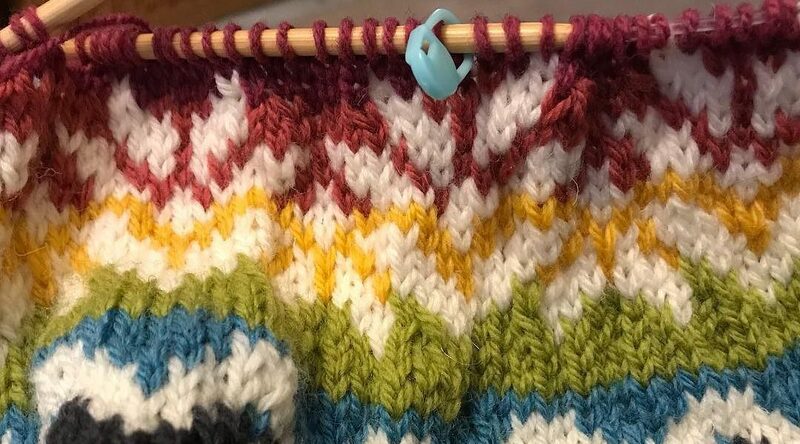 Lily by Marie Wallin: Color/Gauge Swatch #3. This time a sleeve in the round. from Instagram: http://ift.tt/2vFyltt Advertisements Continue reading Lily by Marie Wallin: Color/Gauge Swatch #3. This time a sleeve in the round. OK so, I know I don’t usually blog more than once every 200 weeks or something… but..
OK, so I started Lily yet again. Whaddya think about her new colors? I really love stash diving:) I decided to stop doing the main body of the sweater and instead (as is my usual wont) I decided to knit the sleeves as “swatches” – to check my color choices and to check gauge. On the plus side, this plan is faster and more efficient. I … Continue reading OK so, I know I don’t usually blog more than once every 200 weeks or something… but..